The best IA solo concert I've ever seen. It was really, really, really good. I'd call it the best I've heard him play, it was in Minneapolis, he was at his most serious, professionally speaking, that I have seen him on stage. Just a brilliant musical performance. I remember thinking, "If this is where he's going musically,,,,well then, what a treat we're in for." Well, it didn't quite shake out that way but none the less, it was a great event. Even the second half was amazing - a standing/up-right bass was used throughout - what's this? Acoustic Aqualung? Using the up-right bass with a bow for the electric guitar intro? It sounded great and imaginative to boot....imagine, dah-dah-dah-dah-daaaahh-dah with a bass bow!!! It was a real trip!!! "..He polarized -- the pumpkin eaters, static humming - - panel - - beaters... 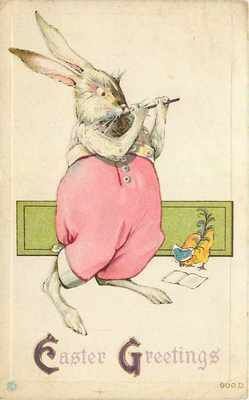 The minstrel in the gallery - - looked down on the rabbit - run." 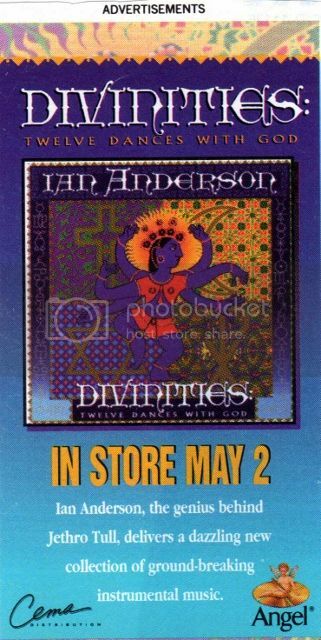 yeah...the very first ever time for me seeing a concert billed as Ian Anderson...in an LA venue that would have never booked Tull, was amazing, as N.S. says: exciting, different, excellent playing and previously unthinkable takes on Aqualung and Locomotive Breath....Ian, Giddings, Noyce and Chris Leslie, currently of Fairport....damn...can't tell you who drummed: Doane?...Mattacks? ...no drummer? someone else? Oh the mists of time. I am a dork...how can I not remember who drummed? It couldn't have been James Duncan in 1995, could it? James would have been about 18, right? maybe? That was Doane on that tour Bernie. I remember reading in A New Day at the time Martin did not want to go to a nearby show because he did not want to see them on stage without him. As they say in England....bless. I do find that touching and part of why the Tull job must always be Martins. I recall Dave Pegg went to see it though. Was that at the Wiltern in LA Bernie? I do have to say thank goodness IA has never glommed onto any one area and staked out a musical home there, I am quite certain the show would have been over long ago had that been the case. Sorry, I would not have been a consistent buyer of Passion Play land with adjuncts at Minstrel In The Gallery, love them though I do. It wasn't the Wiltern...it was a smaller place on Hollywood or Sunset but closer to east Hollywood than the mega-entertainment area around Sunset and highland...can't remember the name of the place ...an old fashioned ex-movie palace that held less than 1200....then Tull came back less than a year later and did Roots at the Universal for 2 or three nights at about 6000 a night. 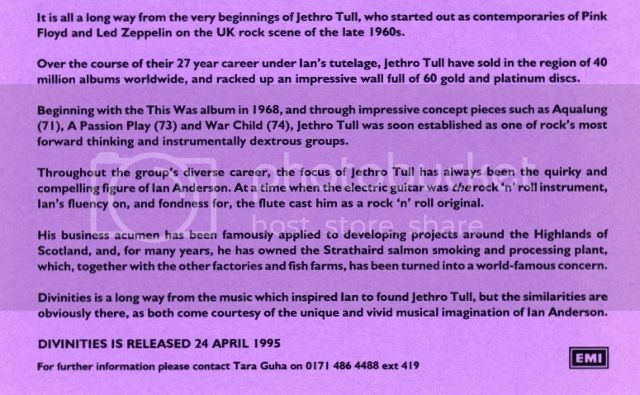 In 1995 there was a big diff between an Ian crowd and a Tull crowd....pity he got stuck in that mindset. One of our favourite concerts. Front row at Massey Hall. 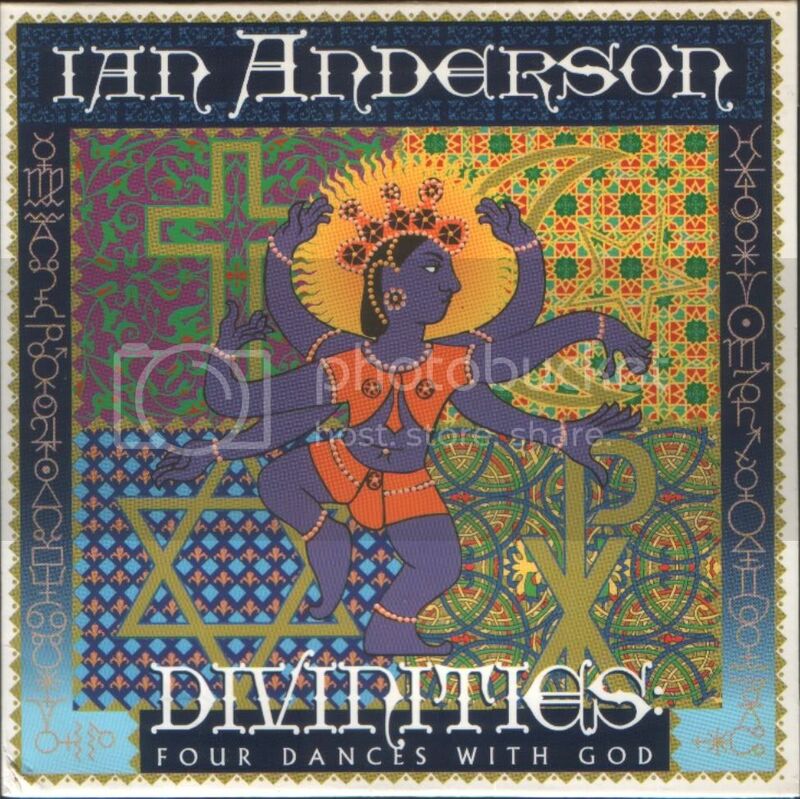 Ian anderson performing "In the Times of India (Bombay Valentine)"
Ian Anderson "Divinities"tour live in Toronto 1995, perfoming "En Afrique". Great stuff as usual, Maddog. Thanks. You know, when Ian (or any musician) plays a gorgeous acoustic piece like "Life...", I hate it when, for the first minute, people scream, "HOOOO"! "YEAH!" "WOO_HOO" over the beautiful acoustic guitar sounds. Shut the f**k up, already. end of rant, thank you. Me too on the mini-guitar...I know it plays and sounds fine...it's just the same old guy vibe I get from cell phone vs hefty old landline...I can't accept that the little thingie works. Got to agree but then it's distinctive - the only other musician who plays one, to my knowledge, is Simon Nicol of Fairport. Btw, I bet it's quite valuable and it is surprising that he uses it on tour. The insurance for it must be astronomical. Great memorabilia and promotional stuff by Too Tull and Graham. 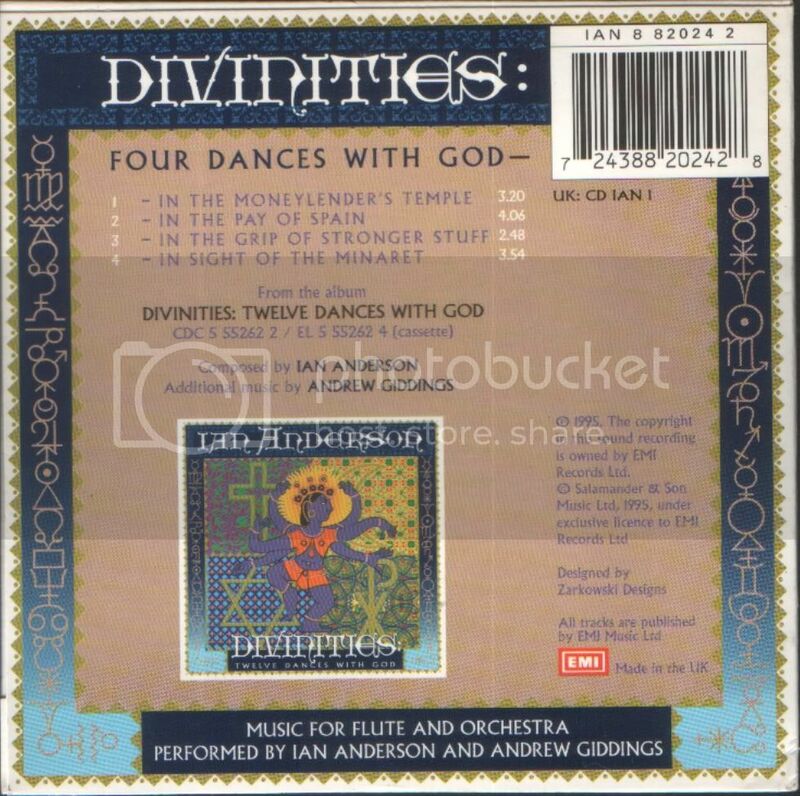 1995 "Divinities" Press Kit folder ;D Bought this at the 1997 Convention at Burlington, Vermont. God is an overwhelming responsibility. I love a nice Press Kit. 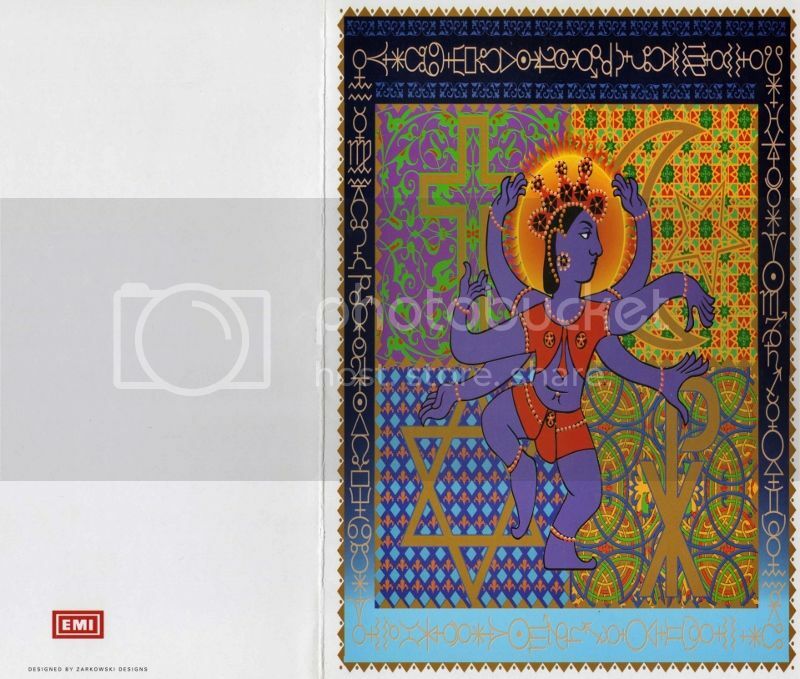 Live at Pantages Theater June 14th, 1995 L.A. Thanks Remy. leave it to a brother from Barcelona to clear up me and ray trying to figure out which old school Hollywood theater this gig was at. What a great night that was. Remy! Golden. 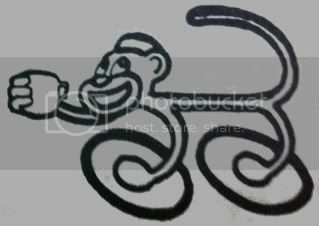 Will be immediately redirected to a few people who may also enjoy it on Facebook. Thank you Remy. 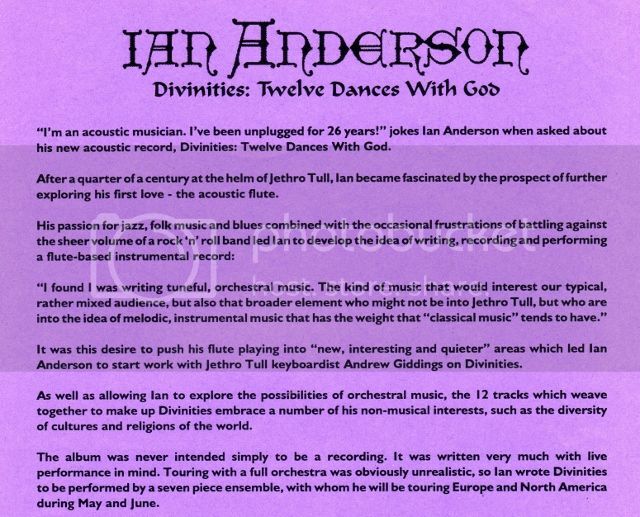 Ian Anderson is also being featured in a book ! 108 Rock Star Guitars. You guys need to check it out, it's going to reveal photos and secrets about Ian's favorite guitar. Like the FaceBook page for more details!